Who will emerge as India's next prime minister or kingmaker in coalition discussions? BBC News profiles the main players. Prime minister since Congress's election victory in 2004. Despite recent ill health - he took weeks off work after his third round of heart surgery this year - Congress have continued to back him as their candidate. Mild-mannered former academic and bureaucrat, 78, who made his political reputation as the architect of India's financial reforms in the 1990s. Criticised by some for his gentle, conciliatory leadership style. Pushed through landmark nuclear deal with US, though lost support of Communist allies in process. 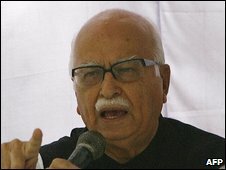 Has never won a popular election, but enjoys widespread support because of reputation as one of India's cleanest politicians. Firebrand, 81-year-old leader of the Bharatiya Janata Party (BJP). Remembered for leading the campaign that led to the destruction of the Ayodhya mosque in 1992 by Hindu extremists. Has since tried to shed his hard-line image, reaching out to younger voters and launching a blog, but is seen as hostage to the BJP's continuing Hindu nationalist politics. Angered support base with trip to Pakistan in 2005. Credited with overseeing the rise of the BJP as a major political force. Served as deputy prime minister under Atal Behari Vajpayee until 2004, before leading his party in opposition. Reputation as an efficient and ruthless administrator. 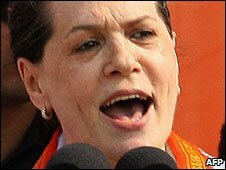 Italian-born president of Congress party. Widow of murdered former Prime Minister Rajiv Gandhi and current leader of the Nehru-Gandhi dynasty. 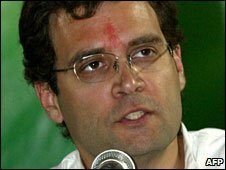 Eschewed politics after Rajiv's 1991 killing before stepping up to lead the party in 1998. Elected to parliament the following year. 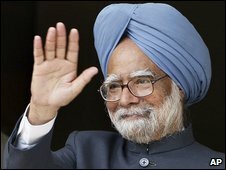 Turned down post of prime minister after leading Congress to a surprise election victory in 2004. Seen as de facto ruler whose influence over the party has never been in doubt. Critics have questioned her political management skills and ability to manage crises within the Congress-led coalition. Opponents' attempts to focus on her foreign origin seen to have failed. Son of Rajiv and Sonia Gandhi and general secretary of Congress. Seen as being groomed to take over from Manmohan Singh at the head of a Congress-led coalition. Member of parliament for the family constituency of Amethi since 2004. Initially refused to take up a leading position in Congress, but now seen to play an increasingly prominent role. Party looking to him to revive its hopes by attracting new generation of voters. Good looking and charming, he is said by some analysts to have a good political knowledge but has yet to prove himself in the tough world of Indian politics. Key BJP figure, chief minister of Gujarat since 2001. Powerful and charismatic, popular among BJP supporters. Criticised for failing to stem anti-Muslim violence in which more than 1,000 people were killed in 2002. Resigned in aftermath of riots, but campaigned for re-election later that year on openly hard-line Hindu nationalist platform. Seen as business friendly and credited with bringing increased prosperity to Gujarat. 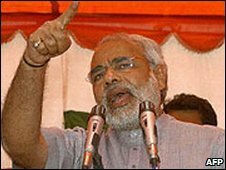 Modi is a popular writer and a poet in Gujarati and Hindi, as well as a fire-eater. Said to enjoy strong support among senior leaders of the right-wing Hindu Rashtriya Swayamsevak Sangh (RSS), which serves as ideological fountainhead for BJP. Served as BJP general secretary from 1998-2001. Leader to millions of India's low-caste Dalits, or "untouchables" as they used to be known. The Bahujan Samaj Party (BSP) leader became India's first Dalit chief minister when elected at head of a coalition with the BJP in Uttar Pradesh state in 2007. Could now emerge at the head of a "third front" in India if both main coalitions fail to gain enough seats. Has recently softened her anti-upper-caste rhetoric as she seeks to broaden her support base, fielding dozens of upper-caste and Muslim candidates in 2007. Critics complain that her multi-million dollar personal wealth - she is known for her fondness of diamonds and lavish birthday parties - jars with her status as champion of India's poor. One of India's most powerful politicians, an on-off ally of Congress. Head of the Maharashtra-based Nationalist Congress Party, known to have long harboured national ambitions. Head of the Indian cricket board, a position of considerable influence in a cricket-loving country. Appointed as defence minister in 1991, returned to Maharashtra as chief minister during religious violence the following year. Last broke with Congress in protest at Sonia Gandhi's leadership in 1999, but rejoined the Congress-led coalition ahead of the 2004 polls, going on to serve as farms minister under Manmohan Singh. 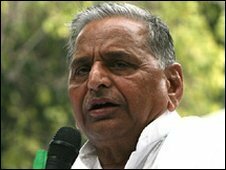 Dogged campaigner and president of Samajwadi Party, a Congress ally with 34 seats in parliament. Chief minister of Uttar Pradesh three times as well as serving as India's defence minister. 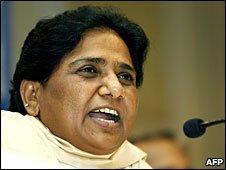 Has alternated in power with Mayawati in Uttar Pradesh since the mid-1990s. Lower castes and minorities still provide bedrock of support. Currently cultivating alliance with breakaway BJP leader which could threaten his Muslim vote bank. Leader of Tamil Nadu state's opposition AIADMK party, and potential kingmaker. Former ally of BJP, but could switch her backing to Congress. Has also shown support for a nascent "third front" of regional and left-wing parties challenging the two main coalitions. 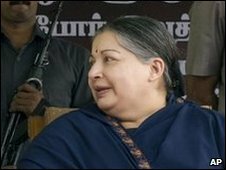 An ex-actress, she was brought into politics in 1982 by former co-star and state chief minister, MG Ramachandran. Took over party leader and chief minister in 1988. In 1998 pulled out of the BJP-led government, forcing fresh polls. Detractors accuse her of encouraging a personality cult, and point to accusations of corruption. President of the Telegu Desam Party (TDP), a key BJP ally, since 1995. Chief minister of Andhra Pradesh from 1995 to 2004. Seen as one of India's most dynamic politicians, who helped turn the state capital, Hyderabad, into an information-technology hub. Believes in what he calls "electronic governance" to cut through the red tape of bureaucracy. But critics say he neglected the rural poor, and did not do enough to quash Maoist rebels powerful in some parts of the state, who came close to assassinating him shortly before he left office. Seen to harbour national political ambitions. 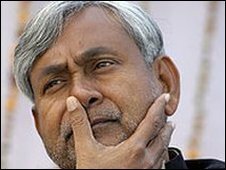 Chief minister of Bihar and former minister of transport and agriculture. Heads an alliance of the Janata Dal United party and the BJP, which holds a clear majority in the state. His victory in November 2005 ended 15 years of rule by the charismatic Laloo Prasad Yadav, leader of the Rashtriya Janata Dal, a key Congress ally. Elected on pledge to restore law and order in India's most crime-ridden state. Recently led a "development march" across Bihar, during which a cabinet meeting was held in a village in what critics dismissed as a pre-election stunt. 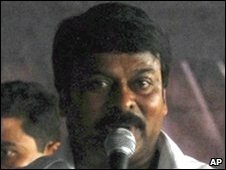 A star of nearly 150 films, Chiranjeevi is the latest in the long tradition of film star-turned-politicians from southern India. The 53-year-old star of Tollywood - the Telugu language film industry of Andhra Pradesh - has launched a new party, Praja Rajyam, which threatens to further divide the votes in the state, hitherto split largely between the Congress and the Telugu Desam party. Still unclear whether Chiranjeevi can galvanise millions of his fans to mop up votes and play spoiler. Declared at party launch in August 2008 that it would stand for socialism and the empowerment of the poor and downtrodden.